Once again, there was little introspection from the coach who took a bizarrely scatter-gun approach to the blame game. He pointedly accused the media of undermining preparation by publishing the team early, while he revealed some of his players had been affected by a bug in the camp but refused to elaborate on the details. 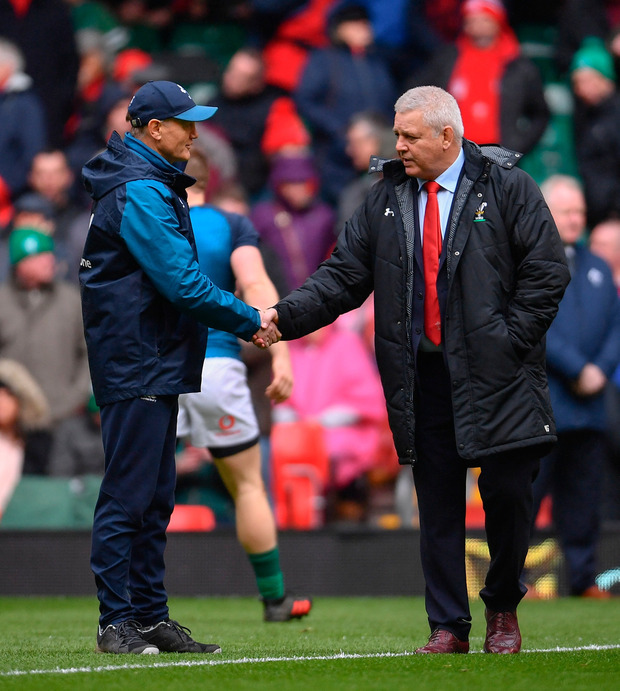 The referee's decisions were alluded to and Warren Gatland was with him there, playfully suggesting that Australian Angus Gardner had been upset that Schmidt's decision to keep the roof open had resulted with him getting soaked to the skin. 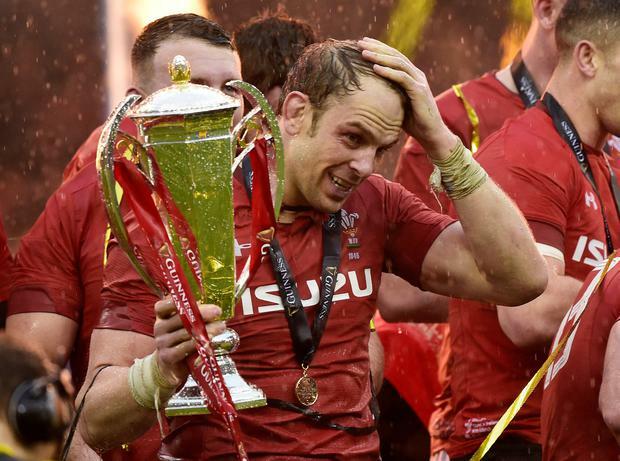 Wales, Schmidt said, had the greater ambition as he suggested that you get an extra 5pc in motivation when going for a Grand Slam. They also had a day extra to recover from the win over Scotland and the six-day turnaround got an airing too. 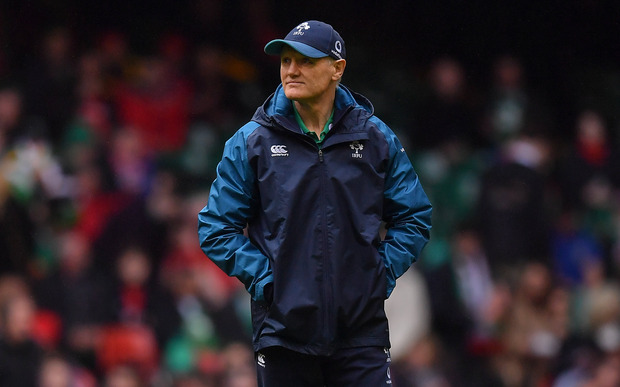 In 20 minutes answering questions and trying to provide assurances, Schmidt never once countenanced the idea that his game-plan is broken or that opposition teams have figured out that, if they can match Ireland physically, they have little else to back it up. Instead, he pointed to past performance as an indication of future success and that's why he will continue to lean on his old reliables despite their alarming drop in form and standards. It was almost cruel that the coach left Johnny Sexton out there for so long on Saturday. The world player of the year appears at war with himself on the pitch and, when he starts dribbling restarts along the ground and kicking the ball deep into the stand when he's aiming for a bounce on the pitch, it is clear something isn't right. When Seán O'Brien was hauled ashore before 10 minutes of the second-half had elapsed there was a sense that this may be the end of a glorious international career, but the ruthlessness is not applied consistently. The undroppables remain just that. Schmidt's boss David Nucifora has spoken about learning the lessons of 2011 and 2015 in their decisions about the provinces signing non-Irish qualified players and exiling those who have the temerity to move beyond these shores. Perhaps it is time now to dust off the Genesis report into 2007. A few weeks ago, the coach said that disaster bore no relevance, but the sudden drop in form and pale-faced shock amongst leading players is all too familiar to those who lived through that disastrous month. What must Jack Carty, Kieran Marmion and Niall Scannell think as they sit in the stand and watch the starters stay in position when their game is failing badly? What must Sean Cronin think as he watches from afar having paid the price for a bad day at the office by being unceremoniously dropped when others are left to play their way into form? Much has been made by the use of 36 players across the Championship, but how many of those actually took their chance to improve their World Cup prospects? Simon Zebo gave us a flavour of his own disenchantment with a hastily deleted tweet from Paris and the discontent that bubbles beneath the surface at times will boil over if the provinces can't provide a happier tale to tell in the coming months. Appealing to "genuine fans" to keep the faith, Schmidt spoke of "journalists and pundits" shaping the narrative. But the commentariat is only responding to what they see on the pitch and for 2018 the team surfed a wave of well-earned positivity. Schmidt can't expect people to ignore the obvious deficiencies in a team who, in four of the last five games, have been well below their best. Rather than telling his former players how to do their current jobs, he needs to focus on his current players' sudden inability to carry out their basic tasks. On Saturday, the fundamentals of their game fell apart. The regime has been built on accuracy, discipline and a rock solid set-piece, but all three deserted them as the rain fell in Cardiff. Their work in the collision was poor and their inability to generate momentum in contact fed a general malaise. Suddenly totemic players looked past their best and unable to influence the game around him. There were glimmers of home, but once Hadleigh Parkes hauled Jacob Stockdale down they became less and less frequent. The loss will hang over the team until they get to Japan. No Ireland coach has ever been set up to succeed in the way Schmidt has. The IRFU's policies mean there are more Irish qualified players playing at club level than ever before; he controls the players' minutes and exerts huge influence over the provinces. The union's message is getting through and more and more players are willing to swap provinces to enhance their international ambitions. In 2018, that resulted in a wave of positive performances; a team that looked invincible as they took on all comers and won. Steve Hansen has suggested that they have struggled with becoming the hunted team, but the issues appear to run deeper than that. Ireland are still trying to carry out the plan that brought them such success, but their execution is a long way off and their opponents appear to know exactly what's coming. Schmidt and the team know that, should they succeed in Japan, nobody will worry too much about a few terrible days at the office in spring. The players can rehabilitate with their provinces before breaking for the summer. When they come back they'll have a new focus and a new goal. In the intervening period, the coach will search for answers ahead of the tournament that will define his era. Everything, including his own game-plan, approach and the security of starts his most trusted lieutenants enjoy, should be on the table.